Sermon Leftovers: Killing Jesus - Should Christian's Read It? Bill O'Reilly is not the first person I would turn to for a theological exposition on the life, death and resurrection of Jesus. However, his recent book, Killing Jesus, has soared to the top of the charts (#4 on New York Time's list as I am writing); so I felt it was probably worth a read. Since I've spent a great deal of time on the road recently, I purchased the audible audio version and listened to the book (narrated by Mr. O'Reilly himself!). Perhaps the greatest compliment I can pay the book is to say that my son Liam enjoyed listening to it. As we loaded the car for an hours drive home, he asked if we were going to listen to more of the Jesus book. "It's pretty interesting" he said. If a freshman boy finds your writing "interesting", you've at least accomplished something. I have a firm policy that I don't finish books which I'm not enjoying or which are not beneficial. I would rather start a new book that has potential than waste time finishing a book which has underperformed. I finished Killing Jesus. Even though, I knew how the story was going to end, O'Reilly's approach kept me engaged and I found myself enjoying his version of the greatest story ever told. I was most pleased that O'Reilly used the biblical Gospels as source documents for his book. He clearly relied on many other sources as well, including all the Roman, Greek and Jewish authors which typically find their way into the writings of those seeking the "historical Jesus." However, O'Reilly blends these writings with the writings of the Gospels in a way that gives credence to the Gospels as a reliable source. In my opinion, this is the element of his book that makes it unique and worth the read. 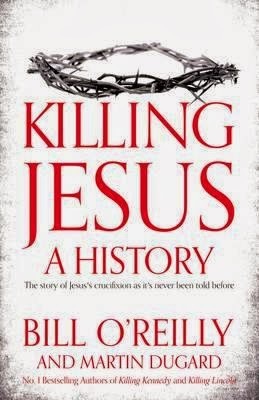 O'Reilly does skirt around most of Jesus' miracles (perhaps a necessity for anyone hoping to have their writings accepted as good "history"). His discussions of Lazarus include little mention of the resurrection, although he alludes to Lazarus' belief that he "owes Jesus his life." However, he acknowledges that the disciples certainly believed that Jesus' miracles were real; and he does nothing to suggest Jesus didn't perform miracles. When it comes to the greatest miracle of all, the resurrection, O'Reilly leaves it to the reader to decide, although, he does so in a way which Christians will appreciate. I can't give this book my highest recommendation, simply because at times O'Reilly's description of the Roman sexual depravity is too nuanced and details. At one point, I had to fast forward because I felt the material was inappropriate for my son (and perhaps for me as well). Apart from that, I think this is one of the better attempts I have seen at describing the "historical Jesus."